Harvest when flowers are about 30% open. Related species include agapanthus, clivia, lycoris and daffodil. Flower clusters are globe-shaped, 4-5 inches in diameter. Stems leafless, 3-4 feet tall. Plant is a bulbous perennial, classed as a monocotyledon, leaves mostly parallel veined. Cut stems produce onion-like odor. 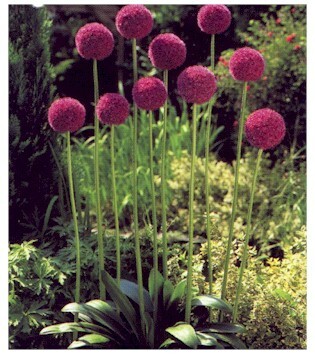 Largest of the ornamental onions. Flower clusters are 4-5 inch diameter balls of densely packed flowers on top of 3-4 feet stout, leafless stems. The specific epithet name of giganteum means large, gigantic. Common garden flower. There have been no developments of commercial cultivars. Allium, Latin name for garlic. Harvest when about 1/3 of the flowers have opened.